Starring Tommy Lee Jones, Will Smith, Linda Fiorentino, Tony Shalhoub, Vincent D'Onofrio & Rip Torn. "Men in Black" was derived from a comic book, and like most comic books it has many contrived plot points. It never offers up, for instance, the reason why two alien races are about to go to war over a missing miniaturized galaxy that hangs as a bobble around a cat's neck. 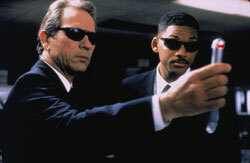 If you want reasons, you're asking too much of "Men in Black." It isn't big on explanation. It's more a "what if" sci-fi comedy that hinges on the laughs overcoming its sketchy plot. What if the supermarket tabloids are right and aliens walk among us? What if there was a top secret global border patrol that regulated these aliens' comings and goings? What if this agency were manned by wise cracking, Ray Ban-wearing, ultra smooth guys like Tommy Lee Jones and Will Smith? "MiB" (as the studio hacks are calling it) is little more than a clever shell designed to showcase one-liners and special effects sight gags. But left at that, it succeeds well enough. About a clandestine government operative (Jones) and his rookie partner (Smith), the movie trades heavily on the charm of its stars. Charged with seeing to it that extra terrestrials behave themselves while visiting Earth, Smith's and Jones' jobs consist of reading the Weekly World News for leads, apprehending little green men and concocting cover stories for close encounters. They carry mean-looking chrome blasters on loan from other worlds and mind-blanking gadgets used on unsuspecting Earthlings who have seen too much. An imaginative variation on the stock cop-buddy duo, their typical day includes busting an E.T. pawn shop owner (Tony Shalhoub) for selling laser guns out of his back room and convincing the local medical examiner (Linda Fiorentino) that she did not just do an autopsy on an alien. Mostly an untidy series of self-contained scenes -- it would make a great set of bubble gum cards -- "Men in Black" is fun nonetheless. Early in the story, Smith is just a Manhattan cop who stumbles onto an alien while on a pursuit. Jones is sent to wipe his memory, but he ends up recruiting him instead. Smith gets a crash course in alien policing -- stopping at a space port hidden inside a sky scraper and chasing a fugitive space immigrant who ends up giving birth to a slimy, tentacled baby on the New Jersey turnpike. He also gets a quickie Who's Who of aliens on Earth -- including Newt Gingrich, Sylvester Stallone and, naturally, Dennis Rodman. Meanwhile a giant alien cockroach searching for the aforementioned mini-galaxy crash lands out in the sticks and hijacks a hillbilly's skin to wear as an ill-fitting disguise. It's the best gag in the movie. Played by a scene-stealing Vincent D'Onofrio, the roach walks around like a drunk while trying to get the hang of the farm boy's body. The pelt is constantly slipping in places and is quickly rotting away. Even though Smith and Jones play well off each other as they try to wrangle the roach in time to save the world, Smith's character is nothing but a rehash of his worn out quick-talking ghetto shtick, and director Barry Sonnenfeld ("Get Shorty") doesn't quite supply the energy a campy romp like this needs. Moments that should be hilarious muster only a chuckle and action scenes that should tingle -- like the final showdown with the unmasked giant roach -- are just not that exciting. But in the company of all the disappointing "event" movies this summer, "Men in Black" almost shines. Science fiction comedy is a hard nut to crack, and while this is no "Buckaroo Banzai," it's a perfectly good $4 matinee.